It has been said that we have more complete maps of the surface of Mars or the Moon than we do of Earth. Close to 70 percent of our planet is covered by water, and that water refracts, absorbs, and reflects light so well that it can only penetrate a few tens to hundreds of meters. 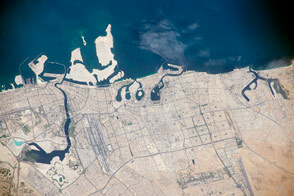 To humans and most satellite eyes, the deep ocean is opaque. There is another way to see the depths of the ocean: by measuring the shape and gravity field of Earth, a discipline known as geodesy. David Sandwell of the Scripps Institution of Oceanography and Walter Smith of the National Oceanic and Atmospheric Administration have spent much of the past 25 years negotiating with military agencies and satellite operators to allow them access to measurements of the Earth’s gravity field and sea surface heights. The result of their efforts is a global data set that tells where the ridges and valleys are by showing where the planet’s gravity field varies. The map above shows a global view of gravity anomalies, as assembled by Sandwell, Smith, and colleagues. 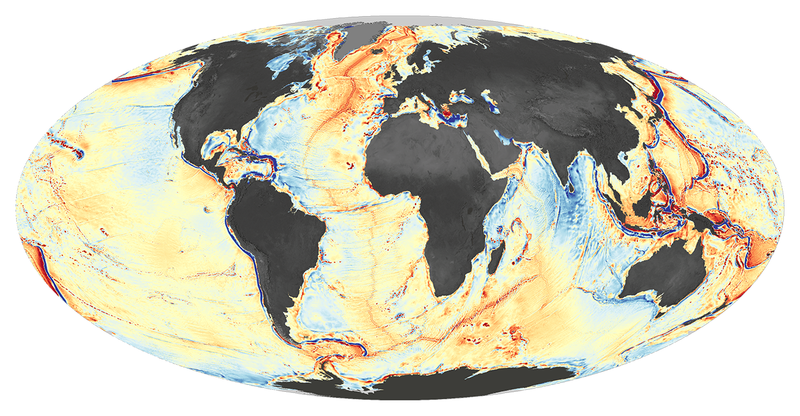 Shades of orange and red represent areas where seafloor gravity is stronger (in milligals) than the global average, a phenomenon that mostly coincides with the location of underwater ridges, seamounts, and the edges of Earth’s tectonic plates. 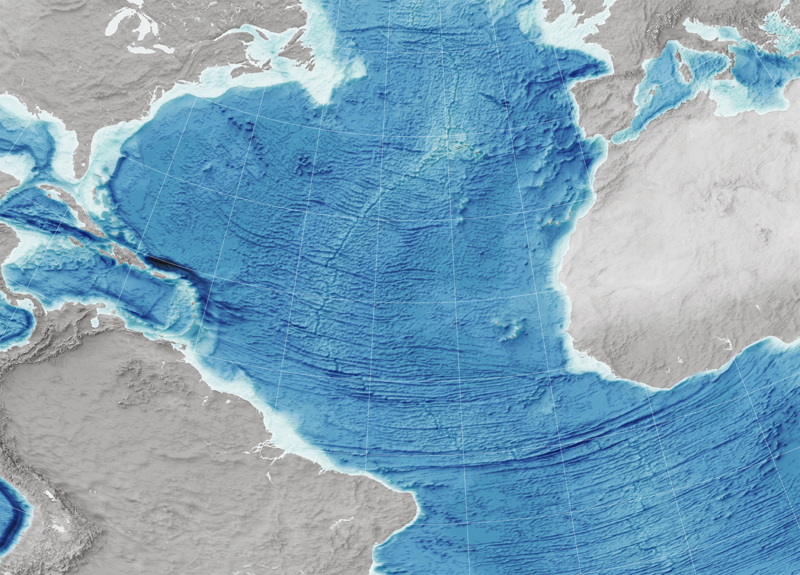 Shades of blue represent areas of lower gravity, corresponding largely with the deepest troughs in the ocean. 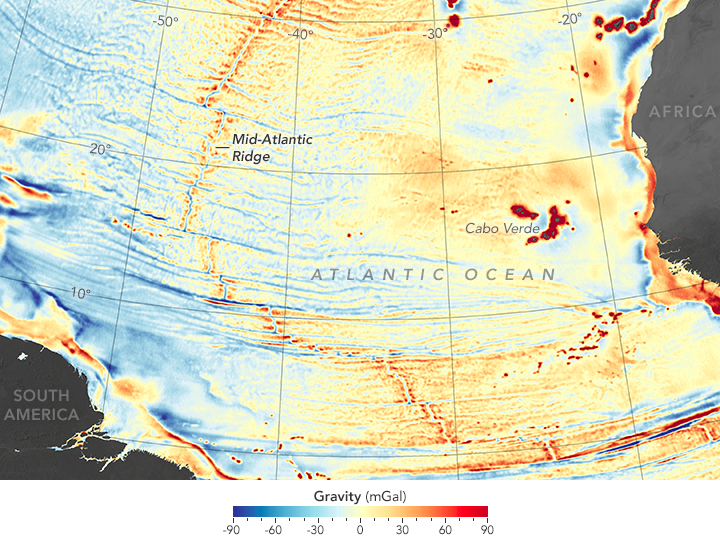 The second map shows a tighter view of that data along the Mid-Atlantic Ridge between Africa and South America. 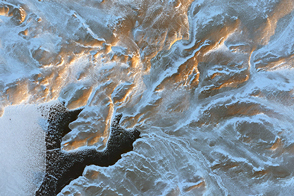 The maps were created through computer analysis and modeling of new satellite altimetry data from the European Space Agency’s CryoSat-2 and from the NASA-CNES Jason-1, as well as older data from missions flown in the 1980s and 90s. CryoSat-2 was designed to collect data over Earth’s polar regions, but it also collected measurements over the oceans. Jason-1 was specifically designed to measure the height of the oceans, but it had to be adjusted to a slightly different orbit in order to acquire the data needed to see gravity anomalies. The new measurements of these tiny bumps on the sea surface were compared and combined with previous gravity measurements to make a map that is two- to four times more detailed than before. Through their work, Sandwell, Smith, and the team have charted thousands of previously uncharted mountains and abyssal hills. The new map gives an accurate picture of seafloor topography at a scale of 5 kilometers per pixel. 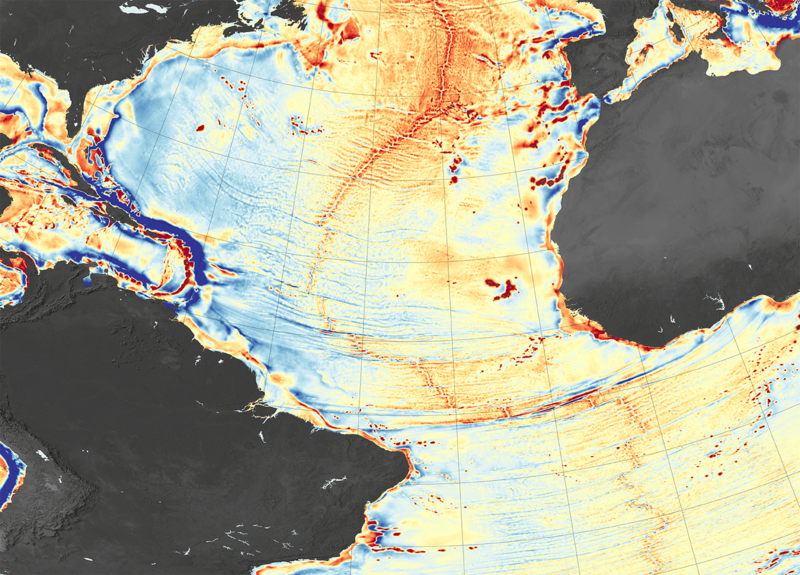 From these seafloor maps, scientists can further refine their understand of the evolution and motion of Earth’s tectonic plates and the continents they carry. They can also improve estimates of the depth of the seafloor in various regions and target new sonar surveys to further refine the details, especially in areas where there is thick sediment. 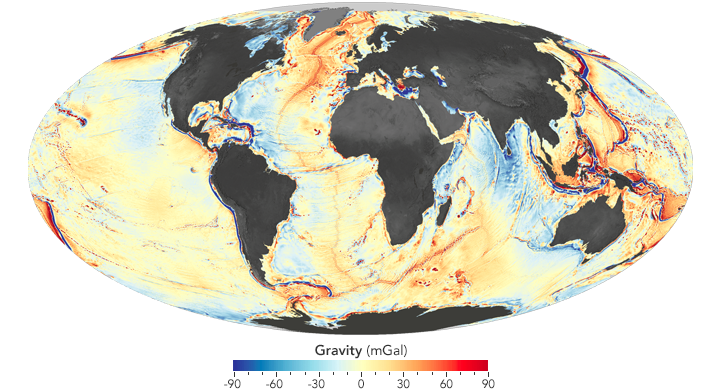 This third map shows the gravity data as a cartographer would represent the seafloor, with darker blues representing deeper areas. 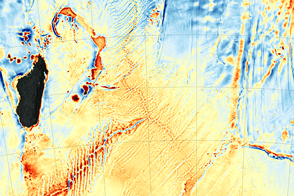 NASA Earth Observatory maps by Joshua Stevens, using data from Sandwell, D. et al. (2014). Caption by Mike Carlowicz. 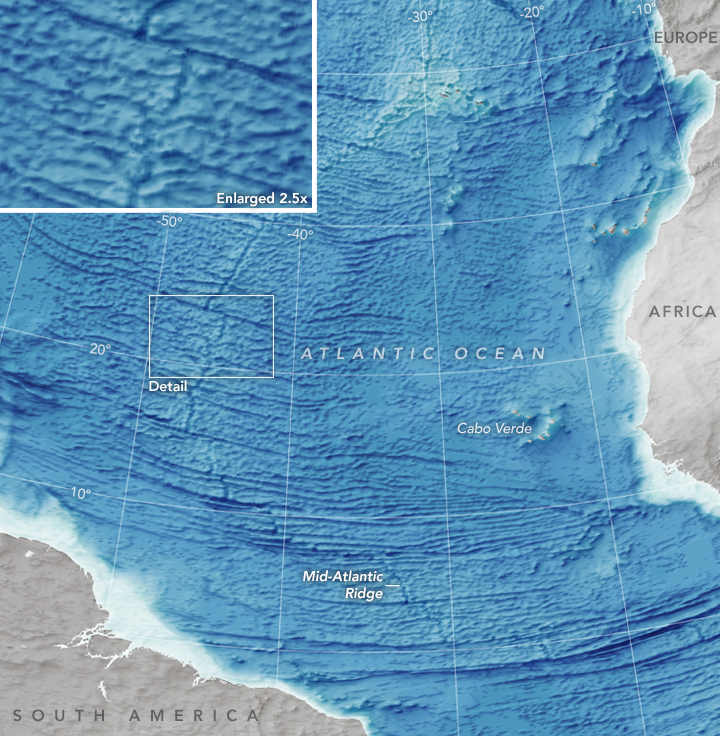 Scientists read the bumps on the ocean surface to understand the shape of the seafloor below.